Sick of over complicated calling cards and bizarre cellphone dialing schemes when making a call to Costa Rica? Well no more! Use our easy “How To Call Costa Rica” guide. Next dial 506 – the country code for Costa Rica. And finally the local phone number – 8 digits. If the Costa Rican number you’re dialing starts with a (+), what then? A handful of international numbers use a plus sign before the main country code. For example, for calling Costa Rica from the U.S. with Vonage, you can replace the “+” with 011, but either works. That covered HOW to call Costa Rica. But What’s the best WAY to call? Vonage World® is super popular. But it doesn’t cover calls to Costa Rica. Unfortunate yes, but Vonage doesn’t give up that easily. Introducing Vonage World Plus Latin America 100*. 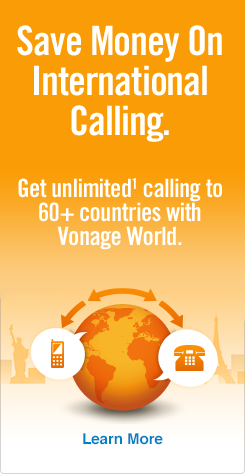 This plan gives you all the benefits of Vonage World, PLUS 100 included minutes to select Latin American landlines and mobiles (including Costa Rica), but check out the Latin America 100 homepage to see if your country made the list. And since your sister in San Jose loves those long chats, if you exceed the initial 100, Latin America 100* has great low rates to the included countries thereafter! Call 1-800-583-5421 to sign up today! Your sister’s in for a big surprise. One that’ll save you both dough. Vonage World Plus Latin America 100 makes calling Costa Rica easy. But it gets better. When your sister signs up for Vonage, we’ll ship her a (via UPS) a Vonage Box™! This gives her the ability to make unlimited¹ international calls to the USA from both landlines and mobiles. This new (and shiny) box comes with a U.S. number, meaning when you call her from your phone, it’s a local call, as it’s a U.S. number to a U.S. number! Its an innovative way to call Costa Rica free! What about international calling apps? Check out Vonage Mobile® for Android™ & iPhone® international calling apps by Vonage. It’s a whole new way to stay connected.